The Greek sunny island of Crete attracts holidaymakers in a magical way. One of the most beautiful places is the former island capital Chania, which is situated in the north of Crete directly on the Cretan Sea and can be easily discovered with a rental car. Extensive sandy beaches, a picturesque harbour and historical architecture from over 5000-year-old city history distinguish the region. Rent a cheap car during your stay to explore the attractive harbour city comfortably on your own. Your Greek holiday in the west of Crete is best started at Chania airport. Here you can pick up your rental car directly after landing and drive to the city from the pick-up point. For example, choose a convertible to enjoy the many hours of sunshine and Mediterranean weather in Greece. With an SUV or small car you can explore both Chania and the mountainous interior of the island. Compare the offers on Driveboo before you leave and choose your desired car. The sooner you rent a car with us, the more you can save. If your travel plans change at short notice, this is no problem: you can cancel your rental car free of charge up to 24 hours before the rental date. Chania International Airport "Ioannis Daskalogiannis" is named after an 18th century Cretan resistance fighter and is identified by the IATA code CHQ. Its predecessor, Maleme Airport, was opened in 1954 for civil aviation. Since 1979, international flights have been taking off and landing at CHQ Airport. With around 2.5 million passengers per year, it is the second largest airport in Crete today. About a quarter of all Cretan air traffic is handled here. 15 airlines connect Chania with several cities in Greece and various destinations throughout Europe. A total of 27 cities in twelve European countries are served from Chania. However, some routes are only offered in the high season. The airport has a terminal. There are various services, including car rental for hire cars, restaurants, ATMs, tourist information and shops. Three major rental car companies currently have a counter at CHQ Airport. These are easy to find as the car rental is located directly in the arrivals hall. Here you can rent a car for less. It is best to book your rental car at home, so that you only have to present your documents to the car rental company. You will then receive the key and papers for your rental car from the car rental company and can then go directly to the pick-up station. The car rental staff will also be happy to answer any questions you may have about your car rental holiday in Chania. The contract you have received from the car rental company will tell you whether you should return the car with a full or empty tank. If you have to fill up your car before returning it, you can do this at various filling stations. About four kilometers from the airport there is a petrol station on Aerodromiou Soudas (94), which leads directly to the airport. There are also petrol stations in the towns of Livadi and Kounoupidiana, which are located west of the airport. Please also note that in Greece, seatbelts are obligatory for the driver and all passengers. A warning triangle, first-aid kit and fire extinguisher must be carried in every car and rental car. Check their presence before departure and report missing items to the car rental company. If you are unable to show the three objects at a traffic check, you will be fined. If you want to park your rental car in Chania, choose a marked parking place. These are often equipped with parking meters. Parking is not permitted at yellow marked places and on priority roads. 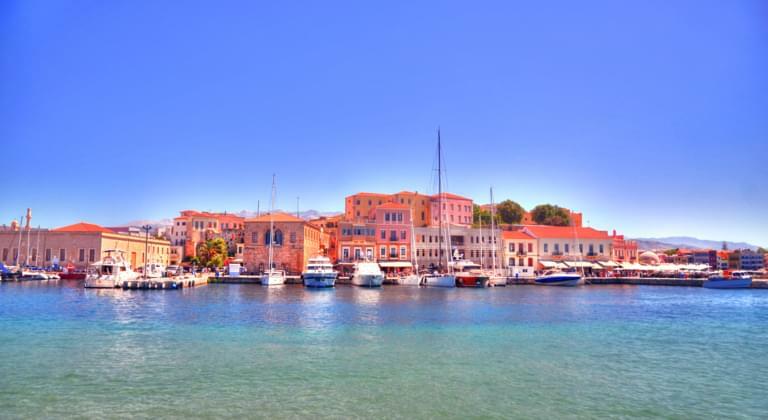 People who like Greece will love Chania in Crete. It is one of the oldest settlement sites in Europe: first traces date back to 3000 BC. Visitors can immerse themselves in the city's rich past and visit impressive historical sights and museums. You will find relaxation on the beach and in nature. If you rent a car cheaply, you can enjoy the diversity of the region best and arrange your holiday individually and independently. Chania is nicknamed "Venice of the East". In today's old town of Chania there are many decorative buildings that the Venetians built. They occupied parts of Crete from the 13th to the 17th century. The Venetian town houses with their decorative facades and stylish balconies provide a romantic flair. The houses from this period reach right up to the Venetian port, which is why the district strongly reminds of its Italian model. The landmark of Chania is the lighthouse at the entrance to the harbour. Rent a car to reach the monument at a reasonable price. The foundation was built during the Venetian rule. The lighthouse, built by the Egyptians in 1830, is enthroned on it. Park your rental car at the harbour and climb up the tower. Above you have not only a great view over the sea, but also of Chania and the bordering mountain range Lefka Ori. Long beaches with fine sand line the coast of Crete. In Chania and the surrounding area you will also find numerous picturesque beaches that attract tourists and locals alike. Here you can enjoy the sun, play volleyball or swim. Often you will find beach chairs and umbrellas here, which you can rent for a reasonable price. The beach of Matala, which is bordered by imposing rock walls, is popular. The beach of Georgioupolis, which lies to the west of Chania, is also considered to be particularly beautiful. In addition, a trip with the rental car to Heraclion is also recommended.